Editor's Note: The following is an op/ed by Roger McClendon, chief sustainability officer for Yum! Brands. TriplePundit hosted an Earth Week Twitter chat with Yum! Brands on Tuesday, April 19. In case you missed it, you can catch a recap here. Imagine strolling into your favorite restaurant. You probably walk through the door focused on what food to order, which table to take and how much it will all cost. Yet there is actually a lot going on behind the scenes you may have no idea about, and it affects the future of the planet. Many restaurants are looking to reduce their environmental footprint. You may be surprised to learn that environmental sustainability ranks as the third top trend out of 198, according to a new survey from the National Restaurant Association and the American Culinary Federation. Four out of 10 survey respondents think environmental sustainability will be the hottest menu trend a decade from now. Reducing energy consumption is a key part of green building design. Restaurants use a lot of energy due to their relatively small size and nearly continuous cooking, ventilation and refrigeration. Many are open long hours or even operate 24/7 and have heavy foot traffic from customers. Reducing energy consumption helps the environment and also saves costs, which helps improve profitability too. Looking at all aspects of sustainable building innovation including energy savings, water conservation, sensible material use, sites and interior environments is vital to reducing a restaurant’s environmental footprint. The restaurant industry is making headway but still has far to go. For example, palm oil, a globally-traded commodity used in many different products from cooking oil to cookies, is commonly produced in ways that involve the destruction of tropical forests and peat lands. The good news is that palm oil can be produced without deforestation — and many companies have begun to make public commitments to use deforestation-free palm oil in their products. The Union of Concerned Scientists (UCS) is asking consumers to tell restaurant companies that deforestation is an unacceptable ingredient in their products. I couldn’t agree more. I would argue that environmental sustainability is no longer a fad in the industry. It’s becoming the way restaurant companies are operating to benefit customers, employees, shareholders and the planet. In optimizing how restaurateurs can be more efficient and minimize environmental impact though innovation, powerful business cases can be created to become more environmentally responsible, raise social consciousness and reduce expenses. Through energy-saving efforts and certifying or building to LEED standards, restaurants have the opportunity to have a positive impact on the environment in not only energy efficiency but in other categories such as water conservation, materials use, site sensitivity and the well-being of building occupants. In order to succeed in the path to environmental sustainability, restaurants must work diligently with vendor partners and seek guidance and counsel consultants and organizations not only to reduce energy consumption, but also help lead the industry to widespread greener practices. We must use our resources more responsibly and make sustainability in the restaurant industry a reality. The United States Green Building Council (USGBC) is a valued supporter of the development of our green restaurants around the globe. Its 12,000 members work together to transform the building landscape to give people better, brighter, healthier spaces to live, work and play whether that means maximizing energy efficiency in older, existing building structures or providing a sound framework for constructing a holistic green restaurant. We at Yum! Brands are also working with the U.S. Department of Energy’s Better Building Alliance and the American Society of Heating, Refrigeration and Air-Conditioning Engineers (ASHRAE) to both promote energy efficiency and find even more ways to reduce our carbon footprint. Sustainability is not just a word to me; it’s a core value and I challenge you, as customers and as leaders, to look holistically at the industry to make the largest impact — ensuring that each year you are doing more for the planet than the last. The next time you walk into your favorite restaurant remember to think beyond the menu. Consider if they are on a path to reduce their environmental footprint. 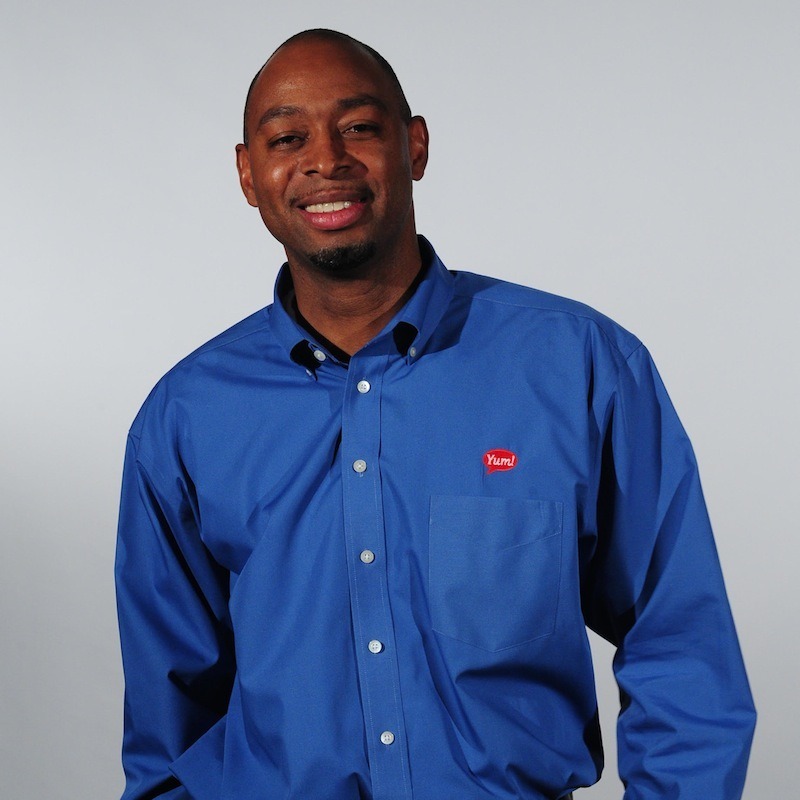 Roger McClendon is chief sustainability officer for Louisville-based Yum! Brands, parent company of KFC, Pizza Hut and Taco Bell. Yum! Brands is listed on the 2015 Newsweek Green Rankings and participates annually in the Carbon Disclosure Project.